Blueberries are my favorite food, even though people close to me might be surprised I didn’t claim chocolate for that coveted spot. Blackberries come in a close second. I try my best to eat seasonally, so every summer I overload on blueberries. Blackberries are so much more expensive that I only limit myself to a couple containers at the Farmer’s Market during July. Four years ago a neighbor passed along a few cuttings from her thriving blackberry bushes, and my husband transplanted them alongside a small vegetable garden in the backyard. I will be the first to admit I don’t have a green thumb. I come by it honestly. My mom destroyed so many house plants that she once put weeds in a hanging basket, figuring they would grow anywhere. Needless to say, that didn’t quite work out as planned either. Each summer I stumble through the vegetable garden, fortunate to harvest a smattering of zucchini, green beans, tomatoes and basil. I occasionally collect a bell pepper or two. I have another neighbor, Joyce, who has the most beautiful garden, and she generously shares, not just of the produce, but also of her wisdom. Yet, deep down – I know that it’s only a minor amount of skill and a whole lot of luck that generates anything from my back yard. 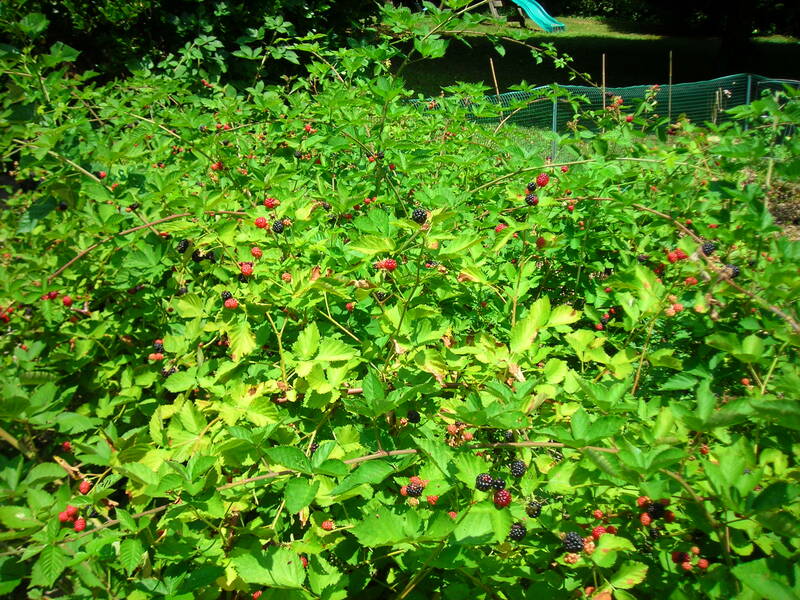 The blackberry bush has continued to expand and flourish, but with minimal fruit the past few years. Only a coffee cup was filled last summer. I honestly gave up. I thought perhaps some of it was my own lack of ability, and the other portion of blame was lack of effort or care. Then imagine my great surprise when beautiful, perfect, black/deep purple orbs dripped from the thriving green limbs. Stun and shock have filled my system. I have already collected two large tubs, and at least as many (and probably more) red fruit are simply waiting to ripen. At my daughter’s request, I even made a difficult blueberry/blackberry gelatte. Blackberry cobbler awaits our family in the future. I’m preaching this Sunday on Matthew 13, the Parable of the Sower. As I spent over an hour in the hot sun, dripping sweat, I contemplated reaping the harvest. As the Bible so often illustrates, we don’t always see the reward of what we sow. And sometimes, try as we might, our efforts are poor. I’ll never have Joyce’s gift for gardening. And yet, God is merciful. Even if we fling our seed in lousy soil or don’t know how to care for the seed or don’t commit ourselves to the growth of the seed, God takes mercy on us. Sometimes when we least suspect it, we find ourselves surrounded by grace, beauty, bounty, and joy – exactly how I feel when I take a freshly plucked blackberry and pop it into my mouth. It’s even sweeter when we know we don’t deserve it. And truthfully, God’s mercy is always a gift – we never deserve it, no matter how dedicated we are to the church or how many good works we do each day. I’m grateful God is merciful. I’m grateful for the harvest – whenever it may come.